A discussion on cobalt glass steins among collectors is usually short and with little or no exchange of information. The deep blue translucent glow of the glass, while interesting, hasn't attracted much attention at the present time. Perhaps a better understanding of the glass can be obtained from the background information gathered from this article. Cobalt-blue glassware was commercially produced in European glass-houses over two hundred years ago. By 1780, German chemists had already combined cobalt metal oxide and clear glass into a powdered form. This development enabled glassmakers to purchase the powdered color and blend it into their own molten clear glass in the glass furnaces. Another important step was the successful production of true clear glass by neutralizing the colored trace elements and impurities present in sand. The powdered cobalt oxide mixed well with clear glass and produced a uniform blue color of great purity. After 1780, glassmakers in both England and Germany had produced cobalt-blue glassware and it was quite popular. An English merchant in Bristol distributed the German product to glass-houses, and it became known as Bristol blue glass. English substitutes for the original were available but were considered to be of inferior quality due to color variations. Bristol also proved to be a good marketplace for the raw material and the English call the cobalt and glass powder Saxon smalt. Before and during the first quarter of the nineteenth century German glass-houses made cobalt-blue glass steins. A typical one-half liter stein, with the gilded German inscription Erinnerung (remembrance), is shown below. 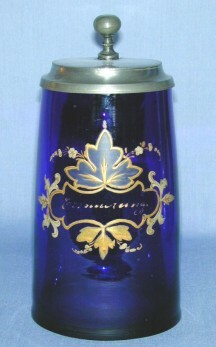 This half-liter cobalt blue glass stein dates to the mid-1800's. The beautiful, rich color of the glass was very popular, although less so for use in beer steins. The enameled and gilded decoration is typical of this period, as is the shape of the applied handle, being wide but somewhat flattened in cross section. Perhaps the popularity of the blue glassware in general prompted an effort to market steins. Certainly dark blue wasn't a good glass color for use as a beer-drinking vessel. The German beer drinker judged the quality of his drink with his eyes as well as with his taste, and beer in dark blue glass couldn't have looked very appetizing. In reviewing that statement, the English and the Germans shared a dislike for dark-colored drinking vessels. The English inserted glass bottoms in drinking mugs and considered the problem solved. This also points out the origin of the glass bottom with the explanation being purely one of marketing, as dark-colored mugs were difficult to sell. Also, several misconceptions can be corrected, as the glass bottom had no connection with the ability of the drinker to detect poison in his ale. Another myth has the Englishman looking through the glass bottom of the mug while drinking to guard against being attacked. That and other similar explanations can be discounted as untrue. However, German steins, with the exception of cobalt-blue and dark glass, had light-colored interiors in the early part of the nineteenth century. Faience, stoneware, opaline white glass and also clear glass were available at that time. Porcelain steins with pure white interiors became more common when production costs were lowered in the latter part of the century. Villeroy & Boch at Mettlach also produced stoneware steins with white glazed interiors, and continued that practice into the twentieth century. Another point for consideration would be the clarity or clearness of German beer during the middle of the nineteenth century. In brewing beer, two different methods of yeast fermentation were in use at that time. The long established method of top-fermentation yielded good quality, but slightly clouded beer. The fermented yeast rose to the surface of the brew and was skimmed off before the lagering or aging stage. Lower fermentation temperatures, improved water quality, longer lagering periods, and newly developed strains of yeast brought about the successful application of bottom-fermentation. In this process, the fermented yeast remained at the bottom of the brew, and as a result, clarity and golden color developed in the lagered beer. Both golden color and clarity became strong selling points among competing breweries and as a result Germans used more clear glass steins and clear drinking glasses for their favorite beer. Another fact comes to light: During the middle of the nineteenth century glass houses developed means of mass producing clear drinking glasses at low cost. This competition also had a negative effect on dark-colored glass steins, and perhaps on steins of other materials, as well. 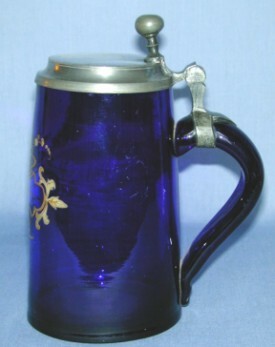 With the renewed interest in steins in the latter part of the century, cobalt-blue glass steins were made in all sizes, including two-liter master steins. Considering the large number of all types of steins produced at that time, and into the twentieth century, cobalt glass comprised a very small number. References: 1. "Chats on Old Glass", R. A. Robertson, 1969, p. 108.